Cover: Kakeru. A character I really don’t care much about. It’s weird how this series made such a big deal about the Sohma family in the beginning, but yet the story has been hijacked by all these newer characters. Page 12-13: Sorry, but neither Tohru no Kyo look like themselves here. 14: At least Tohru isn’t pulling a “how do I feel about him?” shoujo schtick. 17: I can’t imagine how devastating it is to lose your mom, especially at a young age when she’s been really the only parent for much of Tohru’s life. But I find it hard to believe Kyoko didn’t add a “someday you’ll love someone more than me” speech somewhere. 20: First time Shigure and Tohru have really talked in a while. 21: Big information here. But I wonder how certain maids become so special enough to learn the truth. Is it just passed from parent to child, or can you be promoted? Random thought. 26: I wonder if Takaya’s injury was acting up again, or just the bimonthly schedule was really affecting her. Everyone is losing their individual appearance. 31: Tohru doesn’t want to love Kyo even more so than Kyo doesn’t want her to love him. 33: Well, at least we can get the Tohru’s darkness arc over with. 34: Um, why would this be a shock? Rin could have gotten angry with Tohru for some reason. 39: Shigure can’t lie to well in front of Hatori. 45: He can’t understand me, so I’ll tell him! Great logic there. Got to say, Kazuma really has great restraint. 46-47: Slip of the tongue, or truth? 48-50: Uh, there’s better ways to go about that, jii-san. 52-53: Kyo learning more about Tohru. 61-63: Perfectly normal. It’s why people should never feel guilty about seeing therapists. Seek help before things get worse, especially after a tragedy. I wonder if Japan just doesn’t have a lot of mental health services or if manga just doesn’t include it. 68: A blanket acts as a shield. Or sheet or whatever it is. 69: Lucid or losing it? The world may never know. 76-77: Making everyone else feel uncomfortable around them. 82: Tohru senses tingling. And I’d like to see how Kyo would suffer under a Megumi curse…maybe dogs would chase after him? 85: She also could pass for a goth-loli, but I think she needs a parasol for full effect. Mine could also pack a couple of toy pistols and be a fighting nun. 87: Mogeta. Is this Mogeta’s first appearance in the actual manga outside of the gang watching anime? 90: Ouch. And double ouch. 92: Hatori ending the torture. 95: Wasn’t this already confirmed in a side column by Takaya ages ago? 99: Plenty of fish in the sea. 101: If you’re going to change the subject, be subtle. 102: It’s a small world after all. It’s a small world after all. It’s a small world after all. It’s a small, small world. No, I don’t really care for the song. But it was used hilariously in The Golden Girls. That and “Puff the Magic Dragon”. That guy…that huge guy…bwahahahaha! I never cared for the Bob Hope episode, but it has the best opening. Ah, I love that show. But getting off-track here. 104: Who is being tortured more: Machi or Kyo? 106-107: Return of the dysfunctional couple. 111: Tsk tsk tsk… Good-, serious-looking guy with a cheerful, child-like disposition? GAP MOE! 114: I like some ice cream cakes. I don’t like that hard layer like in Dairy Queen’s. Carvel cakes (at least the grocery store variety, never been to a Carvel store) are great. 116: Kisa summons all her courage. 119: Hatori giving Shigure the truth. 122: Don’t most women end up marrying people like their father? 123: I’m not a big barbecue fan. I’m too lazy and impatient. 125: Haru bringing up the forbidden. 126: Momiji being very modest, lol. 127: Then gets Kyo irritated. 130: Well, everyone but Tohru, but yeah. 132-133: I was like, “Who is this? !” until Shishou revealed it’s Kagura and Rin. 136: Kakeru’s girlfriend hasn’t been revealed yet. Hurry up, Takaya. 142: Really, are we done with the student council yet? I’m getting bored. 145: I wish all flashbacks could be this short. 146: Yuki has become a level 2 Machi master. 151: Forgot about the Tohru-Kakeru subplot. 157: It’s so hard to decide what to love and what to collect. Things you open and play worth end up being worth money, but the items you keep in the packaging just aren’t as fun. 158: Try bringing that to school and stuffing it in your locket. I bet the students on day duty would be pretty ticked. 164: We often hear about the victim’s family, but we forget there are other victims. People in drunk-driving accidents, violent criminals, etc. all have families, and many of these people are forced to face the fact their loved ones aren’t as wonderful as they once thought. 173-174: If my boyfriend ever did that…Oh boy. He’d better leave before I really did something. 180: I can understand Yuki’s anger, but I’d be pretty mad if I were Komaki. I’d almost wonder if my boyfriend was purposely trying to humiliate me. So yeah, I don’t think Kakeru’s my type. 182-183: All high school couples must be seriously dating, unless the guy is a player who secretly hates women due to a trauma. Rule of Shoujo #3. 192: Already planning on getting along with her future sister-in-law. 197: A doujinshi? Unusual extra. So after getting back on track with both Tohru and Kyo regaining their positions, they’re pushed aside again. 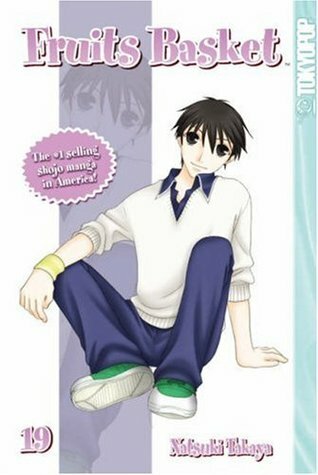 The second half of Fruits Basket really is two manga: a normal high school life story featuring a strange student council (with Yuki as protagonist) and a story about a cursed lead (Tohru/Kyo). The normal storyline just keeps eclipsing the supernatural part. I really do think this is one of Fruits Basket‘s biggest weaknesses. Yuki’s growth and relationship with Machi runs independently of Tohru’s story; there’s very little overlap. Even the Kakeru-Komaki-Tohru connection is relatively minor since it only results in one flashback and a quick apology scene. It wasn’t necessary, and all in all, the whole Yuki storyline might have been better off in a spinoff manga instead of as part of the main story.